The ZCI660MXC is a cooker that has it all. The electric freestanding design has an induction hob with the latest technology and two huge ovens, one with a built-in grill. Cook more dishes simultaneously with one of the largest capacity electric cookers on the market. The 72 litre main oven and 37 litre second oven mean you won’t struggle for space, even when you’re cooking a three course meal. The main oven features a ThermaFlow fan cooking system. This guarantees an even temperature throughout the cavity, for consistently great results. Picture yourself arriving home after a long day to find dinner has already been cooked. With the Auto Cook function, this dream becomes a reality. It lets you programme the timer to switch the oven on and off when you want it to, so a hearty stew can be ready when you walk through the door. 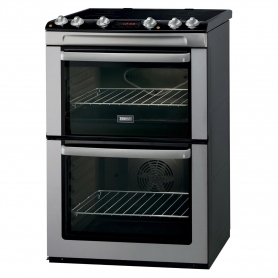 The top oven also has a variable grill function, for complete cooking flexibility. With four induction zones in two different sizes, there’s space for all your pots and pans. The zones have power levels ranging from 1.8 kW to an impressive 3.6 kW. Induction cooking is almost twice as fast as gas – even a large pan of water will boil before you know it. A Set & Go function means you can get on with something else while your food cooks, safe in the knowledge that the zone will turn off after the programmed time. Catalytic liners make cleaning the oven effortless. By lining the top, sides and back of the ovens, this handy little feature absorbs grease and then oxidise it when you’re next cooking at a high temperature. The smooth hob surface wipes clean easily, and there aren’t any awkward pan stands or burners to clean around. As induction hobs don’t heat the pan instead of the cooking surface, you’re less likely to burn yourself. There will be some residual heat, but it’s not as much as with ceramic or gas designs. Air cooled double glazed doors help keep them cool on the outside. This protects you if you accidentally touch the glass while opening the door. This freestanding cooker has standard 90 x 60 x 60 cm (h x w x d) dimensions, so you shouldn’t have any problems fitting it into your kitchen. The ZCI660MXC also has a high-end stainless steel finish for a luxurious touch. 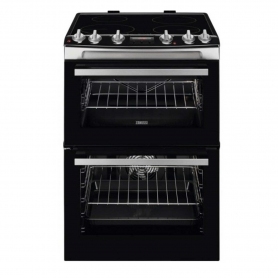 You’ll love cooking with this spacious Zanussi cooker. Add one to your Basket now.